Victor Oladipo scored 33 points to help the Indiana Pacers top the Cleveland Cavaliers 106-102, snapping their league-leading 13-game winning streak. The Pacers made 15 3-point shots. Oladipo made 6 of 13 treys. Myles Turner added 15 points for Indiana. LeBron James paced the Cavaliers with 29 points on 12-of-22 shooting and also had 10 rebounds and eight assists. Kevin Love added 20 points and J.R. Smith 15 for the Cavs. The Pacers shot 44.2 percent (38 of 86) overall while the Cavs were at 43 percent (37 of 86). Kevin Durant had a season-high 36 points to go with 10 rebounds, seven assists and five blocks and Golden State won its sixth straight. Durant came up a few assists shy of a second consecutive triple-double after a 35-point, 11-rebound, 10-assist performance at Charlotte on Wednesday. The Warriors became the 11th team in league history to sweep a six-game road trip. The last team to achieve that feat was the Los Angeles Lakers during the 2008-09 season. Golden State was playing its second straight game with two-time MVP Stephen Curry, who will miss at least two weeks with a right ankle sprain. Avery Bradley's 25 points led the Pistons, who have lost five straight. Reserve Kenneth Faried scored 20 points and grabbed 10 rebounds in leading Denver over Orlando. Will Barton had 19 points and six rebounds, and Emmanuel Mudiay had 18 points. The Nuggets snapped a four-game losing streak. The Magic lost forward Aaron Gordon, the team's leading scorer, in the second half with a concussion, which stemmed from a first-half collision with Denver's Gary Harris. Harris and Malik Beasley each had 12 points. Wilson Chandler had 11 points. Nikola Vucevic led the Magic with 21 points and 17 rebounds. Jonathon Simmons scored 21 points. Lauri Markkanen scored 24 points and Chicago snapped a 10-game losing streak with an overtime win over Charlotte Hornets. Markkanen scored five points in the extra session, and his 3-pointer with 2:08 remaining made it 113-108 and was probably the key basket of the game. The Bulls had not won since beating the Hornets in Chicago on Nov. 17. Kris Dunn had 20 points and 12 assists for the Bulls. Robin Lopez finished with 19 points and 10 rebounds, and Justin Holiday scored 17. Markkanen also had 12 rebounds. Zach Randolph scored 35 points, including a back-to-back 3-pointers to open overtime, to lift Sacramento over New Orleans. The Kings trailed 100-91 with 3:31 left in regulation, but they ran off eight consecutive points to close within 100-99 with 1:06 left. Buddy Hield made a 3-pointer and a layup in that stretch. A dunk by DeMarcus Cousins with 49.5 seconds left put New Orleans up 102-99, but Hield, who scored 18 points, tied the game with a 3-pointer from the right wing with 34.8 seconds remaining. Jrue Holiday missed in the lane for New Orleans, and Randolph missed a baseline jumper on the final two possessions, sending it to overtime. DeMar DeRozan scored 26 points as Toronto rallied to defeat Memphis for its fifth straight. Serge Ibaka scored 21 points and Kyle Lowry finished with 16 points, eight assists, six rebounds and two steals for the Raptors. DeRozan added seven rebounds and six assists. Tyreke Evans led the Grizzlies with 27 points. Marc Gasol finished with 20 points, seven rebounds and four assists. Chandler Parsons had 15 points, four rebounds and two blocks off the bench. Khris Middleton scored 31 points, Giannis Antetokounmpo finished with 27 and Eric Bledsoe added 24 as Milwaukee fought off Dallas. Middleton made five 3-pointers -- including two in the fourth quarter -- while the Bucks' big three combined to make 24 of 54 shots from the floor. Wes Matthews led Dallas with 29 points and had five of Dallas' 10 3-pointers, but the Mavericks had no answer for Middleton or Bledsoe as the duo combined for 27 points in the fourth quarter. 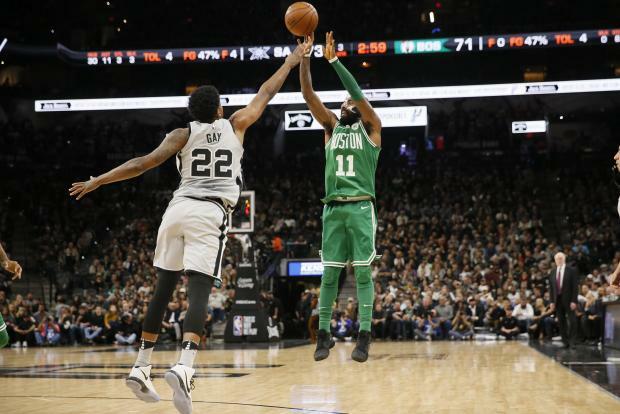 Manu Ginobili canned a 26-foot 3-pointer with 5 seconds to play to lift the San Antonio Spurs to a 105-102 victory over the Boston Celtics in a game between two of the NBA's heavyweights at AT&T Center. The game was tied at 102 after a basket by the Spurs' LaMarcus Aldridge with 1:32 to play. Two Kyrie Irving misses on 3-pointers, an Aldridge turnover and a miss on a 3 by San Antonio's Rudy Gay that Ginobili gobbled up on the baseline with 25.8 seconds to play set the stage for Ginobili to drill his game-winner. Aldridge scored 27 points and grabbed 10 rebounds for the Spurs (18-8), while Pau Gasol hit for 14 points and 11 rebounds for San Antonio. Gay added 15 points, and Tony Parker and Ginobili tallied 11 each for the Spurs, who have won three straight and seven of their past eight games.